Approximately 1,000 faculty, students and staff participated in the 2nd Plus500 Technion Race that took place on April 6, 2016 on the Technion campus. The race was started by the president of the Technion, Prof. Peretz Lavie, and the chair of the Technion Students Association, Omer Amit. 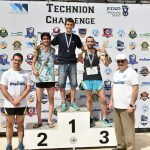 The 5 kilometer campus run was jointly organized by the Technion’s management and the Technion Students Association and sponsored by the Plus500 company. 35 runners from the Faculty of Aerospace Engineering participated in this year’s race, 33 undergraduate and graduate students, and 2 faculty technical staff. The first to cross the finish line, with the outstanding result of 17 minutes and 26 seconds, was Omer Ramon, who started his studies only six months ago. The third to cross the line, with the result of 18 minutes and 30 seconds, was Efi Kelmer. Danny Weinfeld won 2nd place in the category of Technical and Administrative Staff. The Faculty is very proud of all its participants and congratulates the winners !